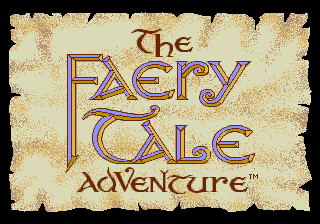 The Faery Tale Adventure is an RPG originally developed and published by MicroIllusions for the Commodore Amiga (as The Faery Tale Adventure: Book I) in 1987. Four years later it was ported to the Sega Mega Drive by New World Computing and published by Electronic Arts in North America and Europe. This game doesn't have good compatibility with the Six Button Control Pad, in this case meaning that it's extremely difficult to select items in shop menu due to game seemingly moving cursor on each frame that D-Pad is held, instead of just once per press. Hold button when booting up the system to switch to 3 button mode and fix this issue. The Mega Drive port is the only console version of The Faery Tale Adventure, though is seen to struggle due to a reliance on the three button Mega Drive control pad when the game was originally optimised for use with a mouse. The Mega Drive version also omits the original subtitle "Book I", presumably because at this point it was assumed MicroIllusions would produced a "Book II". Eventually a sequel did appear as Halls of the Dead: Faery Tale Adventure II, released for DOS and Windows PCs in 1997. The Faery Tale Adventure is a trademark of MicroIllusions, Inc. Licensed to Electronic Arts by New World Computing, Inc.
Main article: The Faery Tale Adventure/Magazine articles.